How Can Anyone 58 Years Old Remember 50 Years of Genii? - William Walter Larsen, Jr. The Wizard of Knoxville - R. C. Buff - reviewed by Gerald R. Blount, Jr. Variety - Sands, Los Angeles Followup - re: The Great Tomsoni & Co.
Slats Out of My Crib Dept. The real low down on Bloodless Surgery! 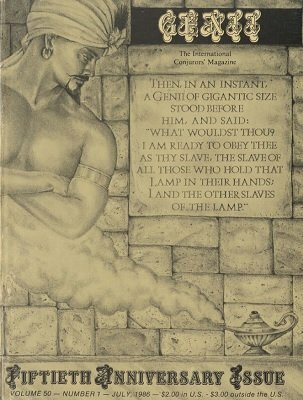 Rub the Lamp - James Breedon - reviewed by Gerald R. Blount, Jr.